Georgetown County Stadium was built in the early 1900’s during the days of the Atlantic Coast Lumber Company. In the following years, it was used as a football and baseball facility. In the late 1940’s, the Georgetown Athletics sponsored by the Loyal Motor Company began play in the stadium which was surrounded by the original tin fence. The Athletics were members of the semi-pro Palmetto League. During the 1950’s, the Palmetto League was a main attraction in Georgetown. During that time period, International Paper Company financed the refurbishing of the Stadium. The tin fence was replaced by the concrete wall which is still standing today. A huge scoreboard was also installed in left field at this time also. The Palmetto League ceased to exist in the late 1950’s, but high school baseball continued to be played at the stadium. In 1962, the facility was converted into a football stadium only. The large stands behind the present day outfield fence were built and light poles stood in the present day infield. The Winyah Gators played the inaugural game in the stadium against Bishop England, and the Bishop England running back ran the opening kick-off back for a touchdown. Eventually, the facility was adapted so that baseball could once again be played at the Stadium. The Stadium continued to be home to Winyah and Howard High Schools’ football and baseball teams until the two schools consolidated in 1982. The facility then became home to Georgetown High’s football and baseball teams. In 1988, a football stadium was built behind Georgetown High School, and the Stadium was once again a baseball stadium only. In 1989, the City of Georgetown passed a resolution to rename the Stadium, Mike Johnson Park, to recognize Coach Mike Johnson for his personal dedication and efforts into rebuilding the stadium into one of the state’s finest. International Paper Company also financed a project in which a replica of the original scoreboard in left field was built. While the newer scoreboard contains lights and a Bulldog with an automated head, its authenticity is maintained by having numbers hung by hand for the inning by inning scores. The scoreboard was also repainted again in 2011. In 1991, Mike Johnson Park began hosting the International Paper Baseball Classic which is considered one of the top three high school baseball tournaments in the nation. Each year, improvements are made to the ballpark making it one of the best high school fields in the nation. Prior to the 1998 season, a covered, lighted batting cage was built on the third base side, a players’ locker room was added to the third base dugout, and additional restrooms were built on the first base side. In 2000, the concrete outfield fence was torn down. The fence was pushed further back and replaced by a ten foot chain link fence which was covered with green wind screen. In 2001,a larger, more modern press box replaced on old one behind home plate. To accommodate the new press box, the main gate was moved between the restrooms and bleachers on the third base line. In addition, new stands were built where the old gate, thus, was increasing the seating by approximately forty seats. Also, signs were placed on the outfield fence to recognize the accomplishments of former Bulldog players and teams. The 2002 season brought more significant changes to Mike Johnson Park. The older wooden stands were replaced by chair seats behind home plate and down the first and third base lines, and the backstop was replaced with netting. Prior to the 2003 season, new lights were installed. The 2008 season brought renovations to the home locker room, the restrooms, and batting cage area. While maintaining the traditional feel of an old ballpark, the ball park has modernized to keep up with the computer age with a wireless network and computerized sound system. 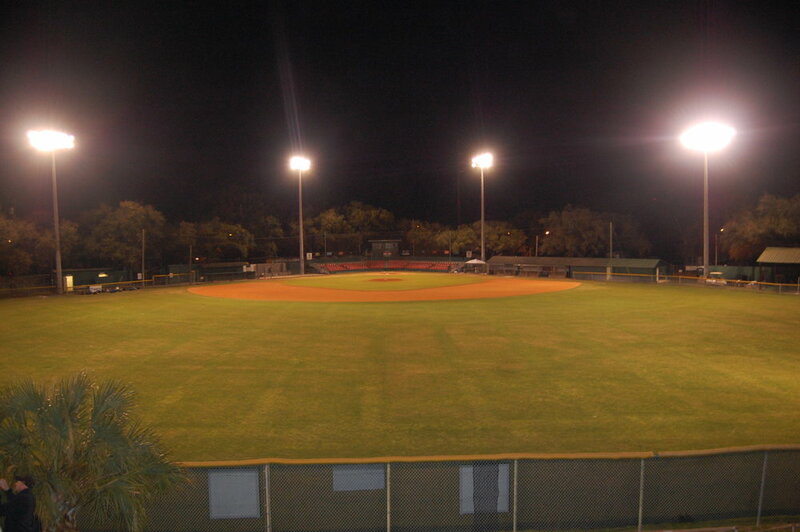 In November 2012, Diamond Prospects named Mike Johnson Park the #1 high school baseball facility in South Carolina. In 2015, Mike Johnson Park qualified for a South Carolina Historical Marker which was unveiled at a ceremony in June 2015 sponsored by the Georgetown County Historical Society as the kick-off to their Smithsonian Hometown Teams Exhibit.